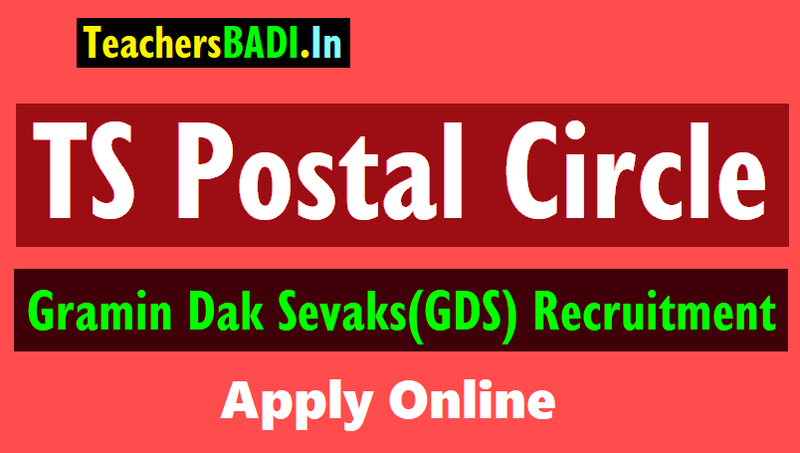 Telangana TS Postal Circle Gramin Dak Sevaks(GDS) Recruitment 2018, Apply online, TS Postal Jobs, TS Postal GDS Posts, TS Postal Circle Gramin Dak Sevak Posts. Govt Of India, Department of Post, Telangana TS Postal Circle has published the Gramin Dak Sevaks(GDS) Recruitment 2018 notification/ India Post TS GDS BPM, GDS MD, GDS MC Posts Recruitment 2018 and Applications are invited by the respective appointing authority as given in the annexure ‘B’ against each post, from eligible candidates for the selection and engagement to the posts of Gramin Dak Sevaks under Telangana TS Postal Circle as listed in the Annexure. Qualification: Pass 10th standard. Should have computer knowledge and will be required to furnish basic computer training certificate for at least 60 days from a recognized Computer Training Institute. Age Limit: Between 18 and 40 years as on 09.03.2018. Division: Adilabad, Hanamkonda, Karimnagar, Khammam, Mahabubnagar, Nalgonda, Nizamabad, Peddapalli, Suryapet, Wanaparthy, Warangal, Hyderabad City, Hyderabad GPO, Hyderabad Sorting Division, Hyderabad South East, Medak, Sangareddy, Secunderabad, RMS Z Division. Selection: Based on marks obtained in 10th standard. Last date for online application: 09.04.2018. The candidates who have already registered and paid the fee in response to the earlier notification dated 18.03.2017 (which stands cancelled) of Telangana Circle need not register themselves against the new notification and do not need to pay the fee again. They are allowed to apply online afresh based on the old registration number and fee already paid in response to the earlier notification. Educational Qualification: The candidate should pass 10th standard from approved state boards by the respective State Govt. / Central Govt. The state wise list of approved boards is at Annexure ‘A’. No weightage will be given for possessing any qualification(s) higher than the mandatory educational qualification. The Candidate passed Xth class examination in first attempt will be treated as meritorious against those passed compartmentally. Computer Knowledge: The candidate should have computer knowledge and will be required to furnish basic computer training certificate for at least 60 days from a recognized Computer Training Institute. Certificates from Central Government/ State Government/ University/ Boards etc., will also be acceptable for this purpose. This requirement of basic computer knowledge certificate shall be relaxable in cases where a candidate has studied computer as a subject in Matriculation or Class XII or higher educational qualification provided the candidate submits a certificate of Matriculation or Class XII or higher educational qualification in which he/she has studied computer as a subject. but before engagement as Gramin Dak Sevak Branch Postmaster. The candidate shall submit a declaration to this effect in the application. The candidate selected for the post of other than GDS BPM should reside in post village/delivery jurisdiction. ADEQUATE MEANS OF LIVELIHOOD: The candidate applying for the post shall note that he/ she will have adequate means of livelihood to support himself/ herself and his/ her family from other sources so as to have to supplement his/her income. However, this shall not be a pre requisite for candidates for the purpose. Selected candidate shall be required to comply with this condition within 30 days after selection but before engagement. The candidate shall furnish an undertaking in the application itself that he/ she has other sources of income besides the allowances to be paid by the Government for adequate means of livelihood for himself/ herself and his/her family. The candidate after selection as Gramin Dak Sevak shall have to give the undertaking again before engagement. FURNISHING OF SECURITY: The candidate applying for the post shall note that he/she shall furnish security amount of Rs. 25,000/- in the event of his/her engagement for the post of BPM and Rs. 10,000/- for other categories. The security shall be in the form of Fidelity Guarantee bond or National Savings Certificate pledged to the Department of Posts in the name of the President of India. The candidate selected for the engagement of BPM shall have to provide centrally located accommodation in the Branch Post Office village within 30 days for use as Post Office premises and the expenditure of the hiring if any needs to be borne by the candidates. ~. No person holding an elective office will be considered for engagement to the post. ~ The candidate selected as Gramin Dak Sevak shall not engage in any activity with any outside agency which would be detrimental to the business or interest of the Post Office. ~ Past experience or service of any kind will not be considered for selection. ~ Cycling knowledge is a pre-requisite condition for GDS posts attached with outdoor duties. ~ A Gramin Dak Sevak shall be outside the Civil Service of the Union and governed by GDS (Conduct and Engagement) Rules 2011 as amended from time to time. 1. Selection will be made as per the automatic generated merit list as per the rules based on the candidates online submitted applications. 2. No weightage will be given for higher educational qualification. Only marks obtained in 10th standard of approved Boards aggregated to percentage to the accuracy of 4 decimals will be the criteria for finalizing the selection. Passing of all the subjects as per the respective approved board norms is mandatory for taking candidate into account for calculating the merit. 3. In case candidates get the same marks, the merit order would be taken as DOB(higher age as merit) .ST Female, SC Female, OBC/UR female, ST Male, SC Male, OBC/UR Male. 4. Candidate can opt any five choice of posts with preference of priority from the Circle/Circles applied. In case if the candidate is selected in all choices the least priority preference will be retained and all other candidatures will be forfeited. Ex : If a candidate opts for five posts with preference post1, post2, post3, post4, post5 etc and selected as meritorious in more than one posts only the post with priority preference will be offered and the candidature for all the remaining posts will be forfeited. 5. In case candidate willfully uploads wrong documents/information and unnecessary documents, his candidature will not be considered. Similarly in case the candidate enter marks erroneously either high or low with reference to marks list uploaded then the candidature will also not be considered. 6. The candidate will get an SMS on his provisional selection on the prescribed date after selection. Mere getting SMS or any other communication on selection will not entitle the candidate to claim for regular selection/appointment. The final selection/appointment will be based on satisfactory completion of verification and genuineness of all educational & other documents produced by the candidates by the concerned authorities. a) Department is not responsible for non-receipt of email/SMS by the candidate due to any specific reason or without any reason arising out of providers services and other dependencies. However, a physical communication in regard to provisional selection intimation will be sent by respective recruiting authorities in due course as per the selection procedure. 7. Candidate can view his/her result status in the website by providing the reference number till the results are announced. once results are declared and post is filled, it can be viewed in the results status which provides all details of the candidates applied for that post. Candidate who desires to apply online will have to register himself in the portal with the basic details to obtain the Registration Number. 1. For registering the candidature, the candidate should have the following essential data. 2. Any candidate will be allowed to register only one time in the portal. With this registration number he may apply to any of the Circles or any number of optional posts. Candidate should not attempt willful duplicate registrations since duplicate registration entitles disqualification of the registration. 3. Fee: Applicant of category OC/OBC Male should pay a fee of Rs. 100/- (Rupees one hundred) at any Head Post Office. However, fee payment is exempted for all Female and SC/ST candidates. They may apply online directly through the provided link in the Website. 4. Candidate who requires to make the payment has to visit any Head Post Office to make the payment. For making the payment candidate should inform Registration Number at the PO Counter. 5. For applying online candidate should submit the application by providing information of Registration Number and Fee payment Number (In case of fee to be paid) and proceed to fill up the subsequent information. Documents uploaded once against one registration number will remain in the server hence for submission of subsequent posts and for other Circles candidates need not upload any documents. The candidates need to upload documents in the following format. IMPORTANT INSTRUCTIONS: The appointing authority of each post reserves the right to modify or cancel the notification of a post at any time without assigning any reason.